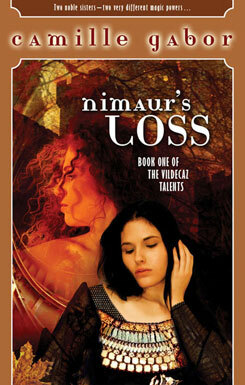 Ninianee and Erianthee, the daughters of Nimuar, Duz of Vildecaz, possess quite different magical talents. Pretty, charming Eri can craft entertainments out of thin air; captivating and energetic Nini can communicate with fur-bearing animals. But Nini's true talent must be kept secret: during the three nights of the full moon she is transformed into an animal--and never knows if she'll be predator or prey. Ninianee's secret keeps her close to Vildecaz Castle and its surrounding forests, while Erianthee is bound for the Imperial Court. Both must play their parts in protecting Vildecaz from political machinations and safeguard their father from the perfidious Yulko Bihn -- a powerful magician to whom Duz Nimuar lost a magical battle, and a great deal of his powers, twenty years before. As heiresses to a rich and independent duzky the sisters can never be sure any man's attentions are genuine. But when intrigue and a mysterious disappearance imperils all, they must decide whom to trust and love. Camille Gabor is an American writer with a diverse background in many fields. Her careers have included classical music and opera, composition, graphic design, research, and animal training. She enjoys horseback riding and good wine, especially California vintages as she is a long-time resident of Northern California. Much of the inspiration for the Videcaz Talents books is Finnish myth and folklore and she reminds us that the Vikings feared nothing -- except the Finns who they believed had powers of darkness and wizardry.